There were lots of things to love about my visit to Chiang Mai in Northern Thailand, but visiting Elephantland has to be the highlight. I’d heard many stories about the mistreatment of elephants for the enjoyment of tourists Thailand so ensuring we visited an ethical elephant sanctuary was really important. Elephantland was recommended by our hostel as the best ethical elephant sanctuary in Chiang Mai for a full day trip. Many of the other hostel guests also recommended it as a top thing to do in Chiang Mai and did not disappoint. We were picked up at 8am and introduced to our guide for the day, nicknamed ‘Super boy’. He was incredibly kind and informative with a great sense of humour. Super boy was with us throughout the day and ensured we had a fantastic experience. Whilst I didn’t meet any of the other guides, I’ve read compelling reviews about all 3 Elephantland guides on TripAdvisor. Elephantland is a small sancturary with only 5 elephants to visit. However, the group sizes are generally quite small, with just 5 of us visiting for the day. Unlike most other ethical sanctuaries in the area, this particular sanctuary only offers full day trips which is much better for the elephants than having multiple groups visiting them each day. We paid 2,200baht per person which is expensive relative to most things in Thailand, but for £52/€61 it was well worth the cost. We all booked individually but you should be able to secure a little more discount if booking as a group. The trip began with a 2 hour journey in an off-road truck up to the mountains just north of Chiang Mai with a quick stop at a local market on the way. The elephant Sanctuary is located on the border of Doi Inthanon National Park and is run by a local hill tribe. The views as we rode higher into the mountains were stunning, but the ride was bumpy and often scarily close to the edge of the cliff – we were holding on tight that’s for sure. When we arrived there was tea and coffee waiting for us and Super boy gave us a flattering hill tribe outfit to wear. If you’re planning a visit to Elephantland, almost everything you need is provided, from water to sunscreen and bug spray. Just remember to bring shoes/trainers suitable for walking through the jungle, a swimsuit and a towel. As Super boy was giving an overview of the day ahead, we caught our first glimpse of the elephants arriving back from the jungle. It was my first time seeing an elephant in real life and was an incredible moment, I couldn’t believe the size of them and just how adorable they were. The first thing we did was learn how to feed them, and they eat a lot! Super boy told us that each elephant can eat up to 300kg of food per day – that’s a lot of bananas! They would take the bananas from us using their trunk, or as we became more comfortable, we could feed them directly to their mouths by saying ‘bon bon’. At one point we even tried passing them bananas using our own mouths which was a little scary! Elephantland is one of the newer sanctuaries in Chiang Mai, open for around 12 years. This is much shorter than other ethical elephant sanctuaries in Chiang Mai. As well as a full day trip with the elephants, they also offer a full day trekking experience lead by someone from the hill tribe or an overnight stay. We met some people who had done these and both seem highly recommended if you are looking for other things to do in Chiang Mai. Once we had fed the elephants, we walked with them through the jungle so that we could see them in their natural habitat, this was a great experience. Super boy has his camera throughout he whole day which allowed us access to over 200 photos of our adventure through the Elephantland website. Two of the elephants were mother and daughter, it was amazing to see them interact with each other. The baby elephant would eat and play in the jungle but never stray far from the mother. At some points she would even start jumping on the mother wanting to play which was very cute. We spent a few hours with the elephants in the jungle and then headed back to the base area. Upon arrival there was a delicious meal of Pad Thai, spring rolls and fresh fruit waiting for us (as well as chicken nuggets for those wanting something a bit less traditional!). We put in a valiant effort to eat as much as possible but there was just too much! 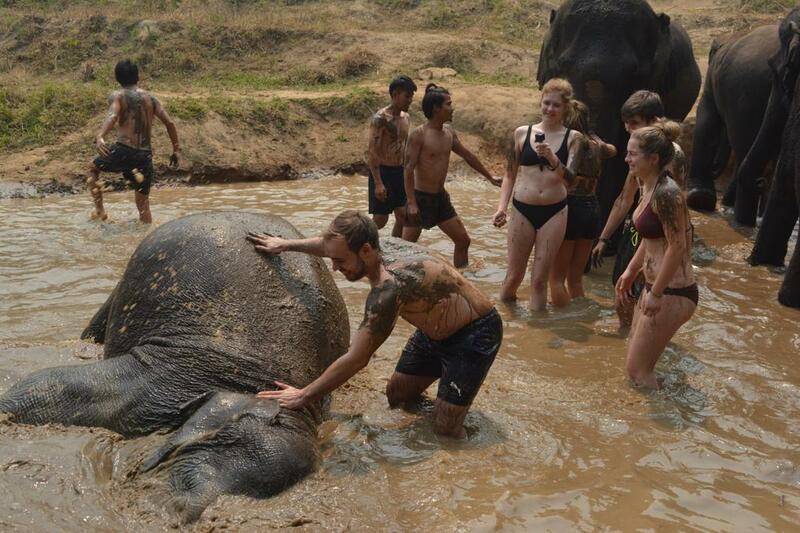 After lunch it was time to change in to swim wear and give the elephants a mud bath. This was a lot of fun but I’m not sure whether it was us or the elephants that had the most mud on them afterwards! It was lovely to see how much the elephants enjoyed the mud bath, especially the baby elephant who just seemed to enjoy rolling around in the mud. Not only is it fun, but the mud is good for their skin. Elephants have very sensitive skin so regular mud baths help build protection against sun and insects. Then it was time for the highlight of the day, we lead the elephants to a waterfall for a wash after their mud bath. Elephantland prides itself as being the only elephant sanctuary in Chiang Mai to have it’s own waterfall which made the experience even better. We were joined in the waterfall by the hill tribe people as well as some visitors who had been on the trekking tour and it turned in to a huge water fight. Before leaving we were able to spend a little more time with the elephants, feeding them (again) and getting some final photos before saying goodbye. Super boy and the hill tribe people made this an unforgettable experience, definitely my favourite thing to do in Chiang Mai and perhaps even in Thailand overall. I can highly recommend a visit to Elephantland if you’re staying nearby.